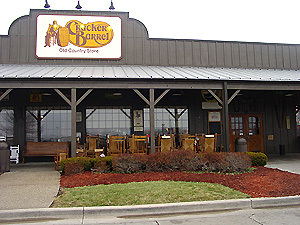 Have you been to a Cracker Barrel restaurant lately? Not only do they make options available for low-carbers, but they actually CATER TO US with our own low-carb menu items! WOW!!! When I opened up the menu for Breakfast, I was flabbergasted that they actually used the phrase “low-carb” on their menu. Now that’s a switch considering restaurants like Ruby Tuesday are running away from the low-carb market. And yet there it was staring me right in the face–”Low Carb Offerings” for Breakfast. Amazing! The same “Low Carb Offerings” section is also on the Lunch & Dinner menu with a whopping 11 genuinely low-carb meals to choose from, including roast beef, grilled chicken tenderloins, spicy grilled catfish, grilled steak salad, and so much more. These meals range from 0-10 carbs each–well within anyone’s definition of a low-carb meal! Click here to learn more about the enticing “Low Carb Offerings” menu sections at Cracker Barrel and why I believe low-carbers should be spending their money there while on vacation this summer.